The past year has seen significant attention devoted to the one hundredth anniversary of the First World War. Britain, France, and Australia are all moving ahead with major commemorative plans. While Canada seems to be lagging behind with formal, federal-led projects, there has been no shortage of interest. The weeks from late July into August—the anniversary of the period leading to the war and of its outbreak a hundred years ago — saw a frenzy of magazine articles, news stories, and fresh books. There has been tremendous study of the outbreak of the war but less effort devoted to its ramifications. A new book by Alan Bowker, who holds a Ph.D. in history and is a former High Commissioner to Guyana, offers insight into how Canadians struggled in the war’s aftermath. 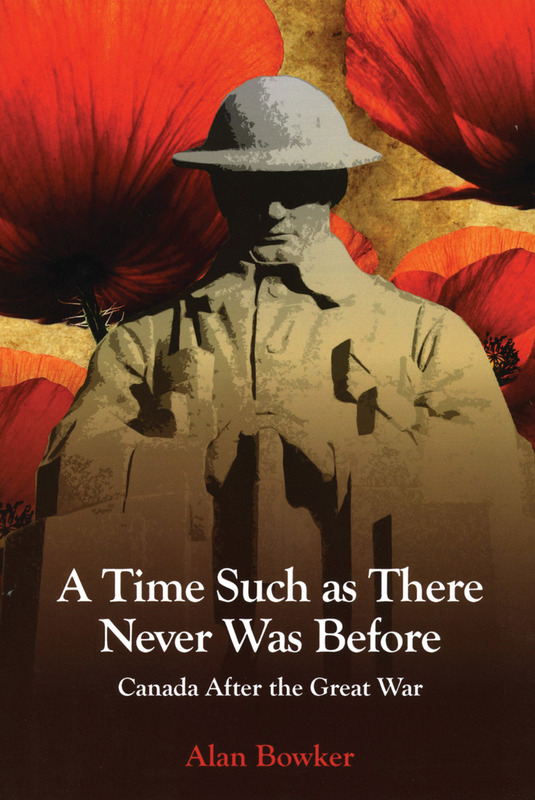 A Time Such as There Never Was Before is a bit of an unwieldy title, but it comes from political economist and humorist Stephen Leacock, who had watched Canada strive and sacrifice in the nearly unlimited war effort of 1914 to 1918. Leacock and many other English Canadians had been willing to pay almost any price in the pursuit of victory, but when the armistice came on November 11, 1918, no one knew how Canada would move forward from the ruin of war. More than 620,000 citizen-soldiers served in uniform, and 66,000 had been buried overseas or would die of their wounds after the armistice. The nation had made a name for itself on the killing fields of Ypres, the Somme, and Vimy yet the exertion during the war had nearly torn the country apart along both existing and newly formed fault lines between regions, classes, and English, French, and new Canadians. Canada would never be the same. Bowker has read widely and draws upon much of the latest scholarship to provide a window into Canada after the war. The return of hundreds of thousands of veterans presented an immediate challenge. These men, many of them wounded in body or spirit, came back to a country that was mired in debt. Women had stepped up to fill many of the men’s jobs, and they were now pushed back to the domestic sphere. The nation was also plagued by the Spanish fu that killed fifty thousand citizens in late 1918 and 1919. Bowker offers poignant insight into this catastrophe and how Canadians reeled from this cruel blow coming on the heels of the wartime losses. From there, he explores the economic impact of the war and the political battles fought by Prime Minister Robert Borden to ensure a presence for Canada at the Versailles peace conference. The struggle overseas was used by many groups in Canada to bring about change. They felt that the war, with its need for tremendous sacrifice, had to be about more than defeating Germany, and many Canadians had impossible expectations for a new Canada. Various groups, largely led by women, had successfully ushered in wartime temperance to ban “demon drink,” and that carried into the 1920s in most provinces. This did not always sit well with returning soldiers, many of whom had grown fond of their almost daily shot of rum in the trenches. Organized religion went through agonizing debates, as the terrible war had, for some, shaken faith. And there were changes to the roles of women in society, although much more was needed for them to achieve equal rights. But the war did not lead to upheaval in all sectors. First Peoples and non-English immigrants who had served in the Canadian Expeditionary Force came back to a country that continued to treat them with little respect or rights under the law. Quebec was further insulated from the rest of Canada as a result of the conscription crisis. The First World War was a period of enormous upheaval. The nation had responded to Britain’s call with a massive war effort, but that had brought unintended consequences. Bowker has done us a service in exploring the turbulent postwar years and in unravelling the intricacies of the war’s impact on Canada and Canadians. Book Review: In their respective books, Bev Sellars and Arthur J. Ray demonstrate how the Canadian historical narrative has excluded Indigenous perspectives to the benefit of newcomers while examining the subsequent reclamation of this space through the use of history.